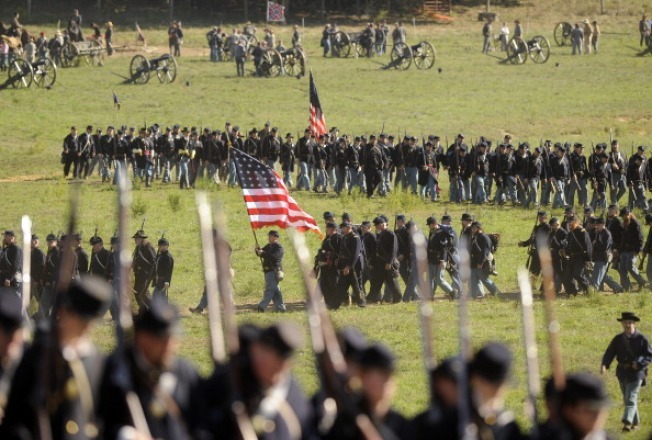 Hitting 60-plus battlefields in four years during the Civil War's 150th anniversary takes as much passion and commitment as getting married or having a child. Rob Orrison has squeezed in all of that since 2011, albeit not without some marital compromises, such as a wedding day on the anniversary of Confederate Gen. Robert E. Lee's surrender at Appomattox Court House, Virginia. Next week, Orrison will conclude his own epic march at the place where the curtain fell on the Civil War, with his spouse Jamie and 2-year-old son Carter accompanying him. "There are worse hobbies,'' Orrison said, while acknowledging his wife's occasional impatience. Orrison estimates he's spent well over $10,000 and logged "thousands and thousands'' of miles on the road, plus a couple of flights to his farthest destinations. Name a Civil War battlefield, and he's been there. Antietam, Perryville, Chancellorsville _ been there, done that. Orrison, 39, marched 3 miserable miles on a dark night in a drenching rain at Harpers Ferry, a rare low point in his travels. He stood under a glittering starlit sky at 4 a.m. at Shiloh, a highlight. On his way, he wondered, "Who's going to be here?'' Some 2,000 people had the same idea. At the commemoration of the Battle of First Manassas, he sweltered in 110-degree heat. In recent weeks, he's been to Petersburg and Sailor's Creek, and stopped in Richmond a week ahead of Appomattox for the fall of the former capital of the Confederacy. All are dominos leading to Appomattox, about 90 miles west of Richmond, and Lee's surrender to his Union counterpart, Gen. Ulysses S. Grant. He travels in his 2005 Ford Escape or a 2011 Toyota RAV4, typically encamping at the nearest Hampton Inn. He often travels with a friend or co-worker, and returns home with T-shirts and books. Orrison compares his travels to a baseball fan's pilgrimage to every Major League ballpark. The National Park Service has aimed to attract more visitors and a more diverse audience during the war's sesquicentennial, adding emphasis on the roles of slaves and freed people, women and civilian life, said Carol Shively, coordinator of the agency's Civil War to Civil Rights Commemoration. Though exact figures aren't yet available, attendance at some parks is up as much as 30 percent, Shively said in an email. Orrison's interest is part professional, too. He's historic site operations supervisor for Prince William County in northern Virginia, and part of his travels are to take notes on what other heritage sites are doing. Many of the battlefields he's visited during the sesquicentennial are return trips, but the 150th has added new layers of history to explore, he said. Orrison grew up in Leesburg, a northern Virginia exurb of Washington that is named after the grandfather of the storied Confederate general and close to dozens of battlefields. About 80 percent of the war was fought in Virginia. A chief takeaway from his campaign: A century-and-a-half on, there's a deep, abiding public interest in the nation's bloodiest conflict. He recalls that a graduate professor told him people are drawn to history for two reasons: to be educated and entertained.